Organized in 1836, the New England Company made fancy cassimeres, a high-grade woolen cloth. This building stands upstream from the Hockanum, Springville, and Florence Mills. The remainder of the New England mill complex is gone. Only this building remains, converted to residential use. Four distinct mill buildings cluster around the Hockanum River. Three of the four are occupied by a textile dyeing and finishing company. The Hockanum passes through a stone archway. 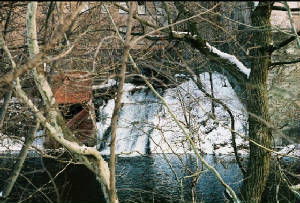 The Hockanum River passes through the complex. 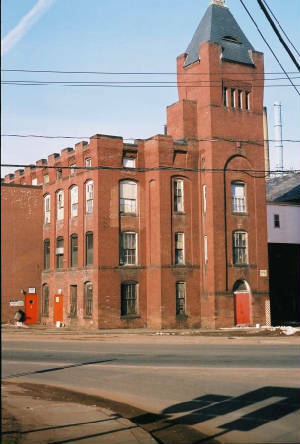 Built by the Carlyle Thread Company, Samuel Fitch bought the mill (right) in 1874 to make liners for rubber boots and raincoats. 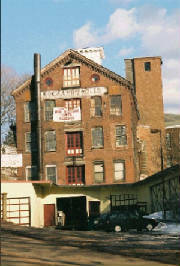 The Fitch Mill was later acquired by the Hockanum Co. It is now used for mini-storage. 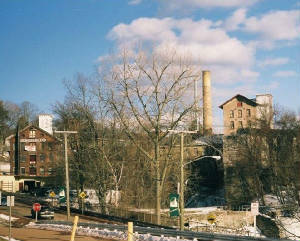 The Belding Brothers Silk Mill was built for the Rose Silk Manufacturing Company in 1867 (left). 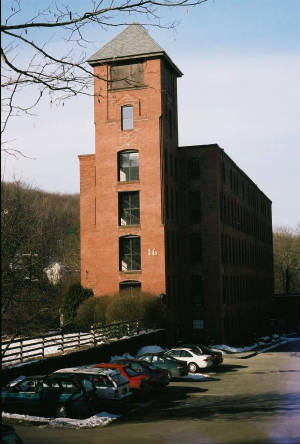 Belding purchased the mill in 1871. It is still actively in use for textile dyeing and finishing. The Belding brothers, Alvah and Hiram, began selling silk as traveling salesmen in the 1850s. With their brother Milo, they began manufacturing silk in a rented building in Rockville in partnership with E. K. Rose during the 1860s. They bought the former Rose Mill in 1871. The Romanesque Revival building to the left was built by Belding Brothers in 1890. By the early 20th century, the company had 3,000 employees in plants in Connecticut, Massachusetts, Michigan, California, and Montreal, Canada. Salesrooms were located in major cities throughout the U.S. and in Montreal. Through a merger in 1926, the firm became the Belding Hemingway Company.